Offers a choice of fixing either the pubic bone or the iliac (anterior superior iliac spine). 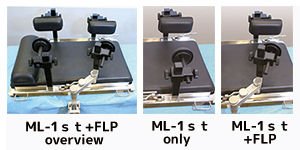 Lateral Positioner Frame “ML-1st” is a radiolucent positioner which is designed to be able to firmly hold and to have the best position for lateral position surgery, especially for surgery around the hip joint. Because it is easy to adjust the body positioning, this operating table can be used for any approach during surgery. Constructed of radiolucent materials of ease of X-raying. Pads are composite of High-functional Gel material (EXGEL®） and highly pliable synthetic leather that makes makes best use of the EXGEL®. This special pad material offers superior dispersion of body pressure. Auxilary pillow and pads adjust to a variety of patient body types. In addition,it maintains the lateral decubitus position in a more rigied fixation because of the pliable synthetic leather used for the pads. It is the Polyurethane synthetic leather used on the surface of the Pads, and it is safe to use them to the patients who is allergic to the latex. ◆It is possible to be used for variety of approaches. 1. Put the patient on the baseframe and position the axillary pillow when setting the patient into lateral position. To avoid damage to auxiliary nerves, take care no to rest the patient’s arm on the rail. 2. Set the connectors and pad hold bars (pic.2-1) to each mounting arm, and slide them into the siderail of the frame. (pic.2-2) Adjust both pads in the desired area to achive a firm hold. Front and rear pads should be vertically in-line for maximum stability. Push down the lever of the mounting arm to hold it in place after deciding its location. 3.After setting the connectors, push the pad hold bars against the patient’s body to give pressure sufficient to hold his/her body firmly. Then, tighten the screw to hold the connector. Designed to facilitate checking range of motion of the hip joint. Use of the Flexible Lateral Positioner (FLP/option), whose pad angles are adjustable, makes it possible to have an even wider range of motion of the hip joint.